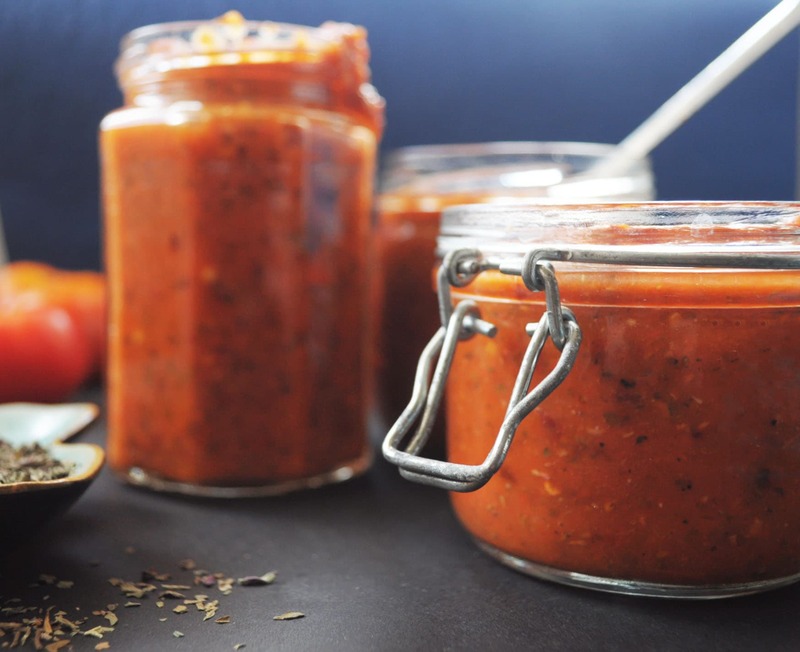 I have been meaning to put this recipe of roasted tomato red pepper sauce up for quite sometime , but something or the other happens every single time I start putting the words down so I have decided I am going to keep it short. This sauce is an extremely easy no fuss roasted tomato red pepper sauce, which doesn’t require any fancy ingredients and can be made with local vegetables.I discovered this recipe a few weeks back on novicehousewife.com and have already made it thrice. This is also a vegan,gluten free,whole 30 and paleo compliant recipe.Its a very skinny sauce and the calories of your dish depend on how you use it. I like to make roasted tomato red pepper sauce in bulk and keep using it through the week. The recipe I have written below gives around 800-900 ml of thick red sauce.I made pizza,pasta,eggplant parmigiano and a chicken bake with this sauce.It worked well with each and every recipe. You can use either dried herbs or fresh ones. I have made the tomato sauce with ½ cup of store bought Italian seasoning and also with homemade Italian seasoning. It works well either ways.I always use red slightly over ripe local tomatoes for this recipe. Prepare a baking tray or sheet by covering it with aluminum foil. Roughly cut the tomatoes, peppers and onions into large pieces and place them on the prepared tray. Cut the whole garlic bulb from the middle. Don’t bother pealing or separating the cloves. Sprinkle some oil and salt. Wrap it in a square of aluminum foil. Place it with the tomatoes etc on the baking sheet. Spray everything with a little bit of olive oil. Roast the vegetables in the oven for 50-60 minutes till the peppers are 70 percent black. Peel away the burnt skin of the red peppers. Squeeze the garlic from the roasted garlic bulb. Add all roasted vegetables to a blender. Add the herbs. Blend together for a chunky or smooth sauce. Check the seasoning and adjust salt and chili as per your liking. Store in airtight jars in the fridge for 1 week. This is such an amazing find! I will be eternally thankful to Chhavi for saving me from buying the readymade bottled tomato sauces. Such an easy recipe where you just need to spend 5 minutes chopping vegetables, rest 1 hour baking and roasting job the oven does for you, and then just blend it for a few seconds. Brilliant and yummy!!! Definitely definitely highly recommended!